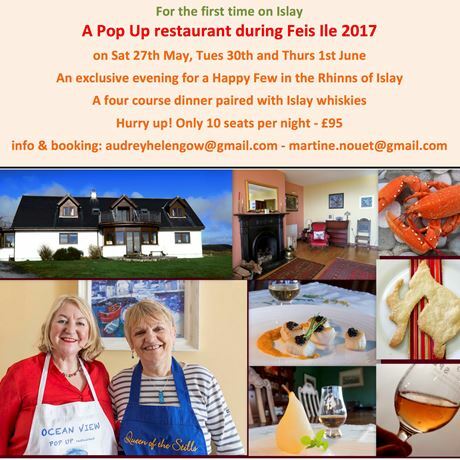 Martine Nouet has partnered with Audrey Gow to host an exclusive pop-up restaurant during the 2017 Feis Ile festival on Islay. The pop-up will run on 27 and 30 May, plus 1 June. Guests will enjoy a four-course dinner, cooked by Nouet and Gow, with each course paired with an Islay whisky. Each night is limited to 10 guests, and places must be booked and paid for in advance. The menu will include Ocean View cocktails and canapes, before an amuse-bouche of lobster bisque with parmesan tuile. A starter of eitherduck terrine à l'orange with a green leaf salad served with a dram of Bowmore Darkest 15 Year Old, or creamy Islay scallops in a puff pastry crust accompanied by Port Askaig 8 Years Old. The main course will offer a choice between slow-cooked roast leg of Islay lamb, gratin dauphinois and French beans paired with Jura 16 Years Old, or seabass fillet, gingery spinach with a lemon and butter sauce, parsnip chips and jersey potatoes matched with Bowmore Small Batch Bourbon Cask. A selection of Scottish cheese will then be served with oatcakes, chutney, nuts and raisins, washed down with Bunnahabhain 12 Year Old. For dessert, there’s nougat glacé, Islay raspberry coulis and Islay strawberries, served with Bruichladdich The Laddie Ten Second Limited Edition. Tea, coffee and whisky chocolate truffles wil conclude the menu, with a dram of The Queen of the Stills Port Charlotte Cask 15 Year Old. £95. Email either [email protected] or [email protected] to purchase.